NOTICE IS HEREBY GIVEN that the annual general meeting of Charged Hong Kong will be held at Dan Ryan’s Chicago Grill, LG228 Festival Walk, Kowloon Tong, Kowloon, Hong Kong, on Sunday 20th March 2016 at 10:30 am. Snack brunch food will be provided to voting members attending. It is anticipated that some members will want to stay on after the meeting for a social gathering and meal. Such costs will be paid on an individual basis. The Hong Kong Government's "Public Engagement Document", on Electronic Road Pricing (ERP) and the upcoming pilot project in central, has been released. We encourage all road users in Hong Kong to read the proposal, and get involved with the consultative process. While the primary purpose of ERP is to reduce congestion, it also has a significant impact on roadside pollution and air quality. Most countries around the world introducing such ERP systems have recognised that fact and incorporate measures to make sure that the polluters pay (by either charging high polluters more, or providing concession for environmentally friendly vehicles). We hope that Hong Kong will follow this approach, as it has had excellent results overseas. The Transport Department of Hong Kong (TD) has released the finalised figures yesterday and it shows how precise my estimate is. Comparing with my post 2 days ago, the total number of EVs is off by just 1, that is my estimate of 4068 versus TD's 4067. And because the number is only differed by 1, all calculated percentages about Tesla Model S stay unchanged and accurate. In the final quarter of 2015, Hong Kong enjoyed the best EV number increment since EV FRT waiver has been installed in 1994. With three consecutive record-breaking numbers from Oct 2015 to Dec 2015 (352, 437, 504), Hong Kong has added 1293 EVs in this period, or 31.8% of the total EV population in the city in just 3 months. The total number of EV per new vehicle purchase has raised from 12.87% in Oct to 16.26% in Nov and to 17.66% in Dec, which translates to 1 EV in every 6 new vehicles. Indeed, an incredible achievement and victory for all people of Hong Kong! Then again, because EVs only constitute 0.51% of all vehicles in Hong Kong, this victory is only a 0.51% victory. In order for Hong Kong to reach 25.5% of Norway, there is still a long way to go. A long way, but the best and only way. First and foremost, I would like to express my gratitude to Forbes journalist John Kang for using my Jun/Jul 2015 estimates. It was a good article he wrote so please show your support by reading it. While I anxiously wait for the Transport Department of Hong Kong (TD) to release their December 2015 statistics (which should be within this week), I am interested in knowing how far my estimates are from the actual ones, which is why I am releasing my latest estimates now. I will release another update when the actual figures are out. The World Advanced Vehicle Expedition (WAVE) is a people's movement offering practical environmentally sustainable actions following the 2015 Paris agreement on climate change. Join the 6th WAVE Trophy with your electric vehicle or with your school. The general idea is to send a climate commitment for each pupil to United Nations and the leaders of the world. On a particular day around early April 2016, the WAVE Hong Kong will send an electric vehicle to your school to pick up the commitments and take them to the nearest port - to be shipped to Bremerhaven, Germany. From there, 100 electric vehicles will transport those cards in a convoy to United Nations in Geneva, creating not only the world's largest card mosaic (a new Guinness World Record), but also sending a strong message from each pupil to the nations of this world. Finally, each pupil will find his card online, when a drone will take a high resolution photograph of the whole mosaic. Read more about Be part of the WAVE! It was in 1994 that the HK SAR introduced the initial exemption of “First Registration Tax” for electric private vehicles ("EV FRT Exemption"). Ever since, this exemption has been renewed multiple times. Last was March 2014, this time for a period of 3 years, to be reviewed by March 2017. As EV (Electric Vehicle) technology is finally starting to catch up to fossi-fuel cars, the change is starting to take off - 20 years after the first exemption was passed. 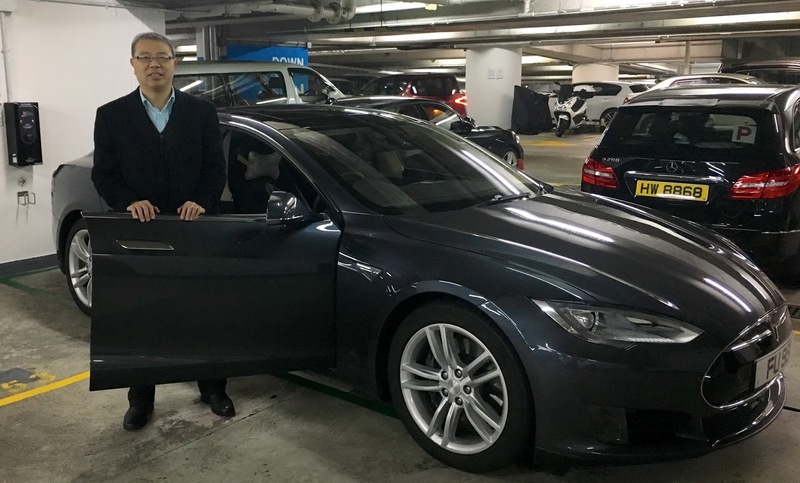 In Hong Kong, the group of EV owners is now growing outside of the early-mover stage into where ordinary citizens have started to replace their fossil-fuel cars with and EV. To combat climate change, we rallied through 2015. One year ago, before Charged Hong Kong was founded, we organised a rally in the name of Tesla Motors Club Hong Kong and donated the proceeds to Hong Kong Shark Foundation. We had about 14 Tesla EVs participating. We made new friends and had tonnes of fun! During 2015 Drive Electric week in Hong Kong, I won a BMW i3 for a weekend. This turned out to be 4 days (Thursday to Monday), driving just over 300 km. My own car is a 2014 right hand drive Tesla Model S (pre-drive assist version). Both of these cars are fully electric - the only way to power them are using a plug (In Hong Kong, the serial hybrid i3 iRex isn’t sold due to registration tax incentives not covering hybrids). We are a family of two adults, as well as a 21 month old boy and 3 month old girl. TLDR - Conclusion: The i3 is a really nice car. In some ways, the i3 is better, in other ways, the Tesla Model S is better. Both cars are highly recommended - for details, read on. … as well as a short time lapse video, showing two kids, two car seats and a tandem Sit’n’Stand stroller being loaded in the i3. My wife is taking the time lapse video so she is not in the video, but will also fit into the car, obviously.